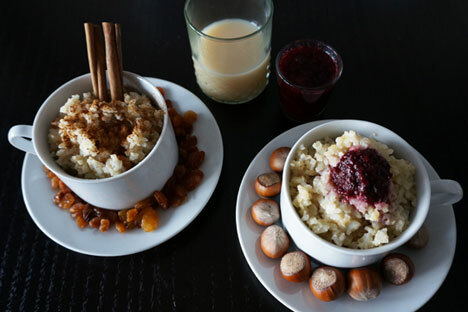 Although rice pudding brings back unpleasant childhood memories for both Russians and Australians, it may be the only dish the countries share. While Granny and I agree on most things, culinarily speaking, there is one thing we disagree on completely – rice. I prefer long-grain rice boiled till cooked, but not mushy, while Granny likes short-grain rice boiled till it’s almost porridge. I think short-grain rice from Krasnodar was the only type available in Russia for a very long time, even in my childhood. I remember basmati and then black and brown types arriving in the late 1990s. They were all the rage for a while, along with green tea and real Italian pasta. I decided to try making Soviet rice pudding, although I had my doubts: milk in combination with rice or pasta brings back memories from the cafeterias when I was in kindergarten and during my early school years. Milky soups were very popular with the cafeteria cooks, but not so much with the kids. I compared recipes with Caye, my mother-in-law, and the only difference we could find was that in the Soviet recipe, the rice is already cooked before it is baked. I followed the Soviet recipe, although I also added cinnamon, and made berry and wine sauce to go with it, as suggested by the Book. I liked it, too, much to my surprise. In the future, I would cut the amount of sugar and definitely add cinnamon, but it was really good! We both finished our servings, although my husband ate my share of raisins – picking them out is a die-hard childhood habit of mine. Anastas Mikoyan, the Soviet minister behind the creation of the Book, would have been proud, I think – a Westerner converted to a meal from the Soviet diet! As for me, it was certainly fun to talk to my mother-in-law about a meal from the Soviet cookbook that she knew so well. If they had a mutual language, Caye and Granny would probably talk for hours about pudding and zapekanka. Soviet, English, Australian – rice pudding can travel across distance and time, it seems. Put well-rinsed rice into some boiling water. After 10 minutes of boiling, drain the rice and add it to the pot with hot milk. Simmer another 15 minutes, then cool slightly. Separate the eggs. Mix the egg yolks with sugar. Add the vanilla, and mix with cooked rice. Add the pices of dried fruit, raisins, nuts and egg whites that have been whipped into a thick foam. Stir well. Put the mixture in a pan that has been greased and sprinkled with breadcrumbs. Bake 30-40 minutes in medium heat. Serve the pudding on a serving dish. You can serve with berry or fruit or berry sauce in a separate dish.